Cheltenham Reflexology and Massage has been based at 1 St Margaret’s Terrace, Cheltenham since 1st January, 2017, after moving from our previous premises. 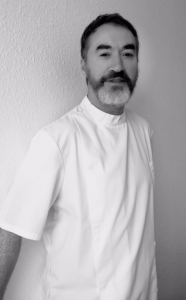 We have been joined this year by Duncan Cameron-Mitchell, an Osteopath with over 25 years of clinical experience. We are often asked, by our clients, what an Osteopath does so we asked Duncan to tell us more about himself and what his treatments entail. T: Tell us a little bit about yourself? Well, I am married to Sara and have been for eleven years. We have a son , Euan, who is seven . He works as a sleeper agent for Ofsted challenging teachers to greater feats of patience . We live in Cheltenham in a house that appears to have shrunk over the past seven years. T: How long have you been an Osteopath? Twenty-six years now. I trained at The British School of Osteopathy. T: What does an Osteopath do? Primarily, we are known to diagnose and treat muscle and skeletal injuries. This we do through a combination of making a note of the patient’s full medical case history, observing the range of movement and testing the joints and muscles for pain and tightness. T: Yes, but how do you treat the problem? This will depend largely on what the problem is! However, usually soft tissue massage and joint mobilisation figure in most treatment sessions. T: Joint mobilisation? Is that the bone cracking we hear about? No. mobilisation is simply identifying a tight area and encouraging normal functional movement. Think of it as a rocking motion. The bone cracking as you put it is manipulation. This technique is much misunderstood. Done correctly and with a patient confident and relaxed there is no pain. Our joints pop and crack at different times of the day and we feel no pain as they do this. T: Do people have to strip off completely? No! What a patient wears is down to them and what they are comfortable with. It can be shorts and a sports top for instance if a patient prefers. A gown is provided if they desire. We do need access to the skin much as a masseur does for effective treatment though. T: I see you use acupuncture. What does that feel like? Well I can tell you that its nothing like an injection or a blood test. My patients tell me different stories. Some feel absolutely nothing, others warmth, others a tingling and occasionally a dull ache is reported. What seems to be very common is a sense a deep relaxation and sleepiness later as a result of the endorphins that are released. T: Do you specialise in treating certain conditions? No I don’t. I know a lot of practitioners like to treat one particular condition and certainly from a business sense becoming known as the ‘jaw man’ or ‘baby clinic’ would be advantageous. However, I enjoy the variety of general practice. Yesterday I saw two Achilles problems, two Rotator Cuff injuries, an Arthritic hip and several lower back strains. T: What advantage does your experience give you? Regardless of the fact that I have treated over 40,000 patients in that time, I believe that there is a wisdom that comes with age. If you are open to the fact that you can never know everything, you can never ‘fix’ everybody, then you will not become arrogant or lazy which is a trap that can befall some therapists. T: What are your strengths as a therapist? Oh, and some patients like my ‘dry’ sense of humour. Marketing, business sense and flapjacks. T: Are you staggeringly rich due to the incredible fees you charge your patients? Alas no. A consultation will cost you £38 (approximately 3 euros if you voted remain). If you are lucky enough to have health insurance then your treatment will be covered by the insurers usually. T: How do we contact you?